Professional race custom cycling jersey using a carbon fibre thread interwoven in microfibre allows to make super-lightweight jersey that is still very strong; so it is very resistant to threads being pulled and general wear and tear. Meanwhile it has a very high wicking capacity (so it helps sweat to evaporate from your body), helps to regulate body heat and won’t stick to you when you start to get sweaty. Made with our new Biofit design, which incorporates lycra mesh sidepanels to give a better fit and follow the body contours – the jersey is designed to fit perfectly when you are in the riding position, with your arms stretched forward. 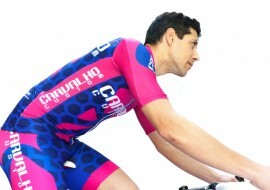 Also incorporates a silicone body gripper to stop the jersey riding up and is available in male and female versions and you can design your own cycling jersey online. Three elasticated pockets, ¼, ½ and ¾ – length front zipper optional. Also available in a less technical microfibre fabric, NK Microfresh, better suited to MTB although still a high quality microfibre. Here is a short video explaining how the Biofit custom cycling jersey works to give you the perfect fit.